Makes me incredibly sad. Probably my favorite metal artist ever. I'm pretty bummed out today after reading the official news. It's gonna be pretty hard and emotional watching the "Revolver Golden Gods Awards" show this Saturday night (May 22) on VH1 Classic. The event was taped in early April and it will be the final time we get to see Dio alive. There is an exclusive clip of Dio being interviewed by the hosts of "That Metal Show" on the VH1 Classic website, as well as Eddie Trunk's website. 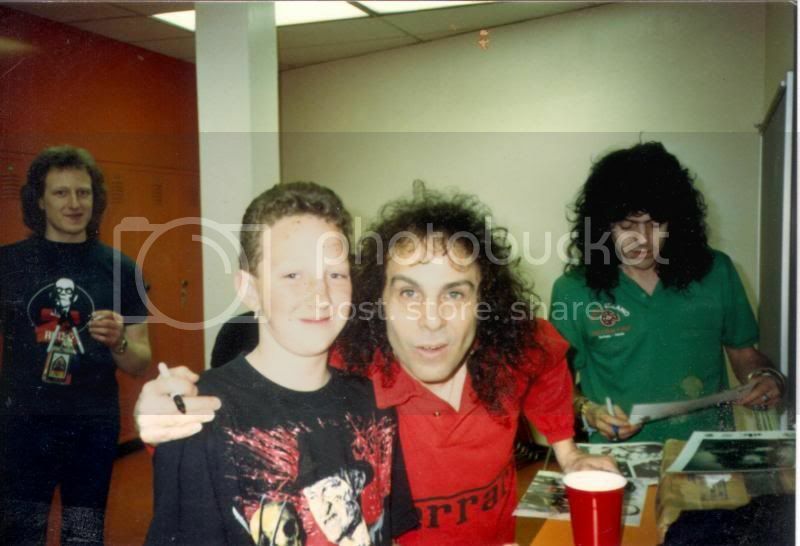 Dio appeared to be in good spirits and optimistic about an upcoming tour (which unfortunately was cancelled not long after that interview). All of this is so overwhelming. It is a sad day for all of us who admired Dio over the years. I always imagined the greatest voice in Metal would continue rocking until he reached 80. Dio may have lost his mortality, but his spirit and music will continue FOREVER. Long live the 'Man on the Silver Mountain'. Sad, sad day for metal. I'm glad I got to see him live. It was a true honor to see a man who could sing and put on a stage performance that was 100x better than "performers" half his age. Last edited by Giantrobo; 05-16-10 at 06:08 PM. I'm listening to Heaven and Hell (the album) now. Such fantastic songs. Such a great voice. I have not been this choked up on a celebrity death since Bo Schembechler died. John Ritter a close second. I grew up with all 3 of them. I'm just glad I got to see Dio open for Maiden twice. Several 80's metal legends all at once. Dammit! I've been working on the yard all day and thinking about Ronnie the whole time. Somehow I felt this was a death watch, and low and behold that's what it turned out to be. I wish it had turned out differently. Damn. I was hoping that Ronnie would beat the odds, even if that wasn't a particularly realistic expectation. Ronnie was (and will always be) my all time favorite singer. He was not only a great singer, but he was a great songwriter and a great performer. He was also a class act who always treated those who loved his music with respect and kindness. His loss is immesurable. He was a giant. R.I.P. Ronnie. You will be greatly missed. First saw him perform on the Mob Rules tour with Sabbath, followed by his first two solo albums. All three shows were remarkable. He will be sorely missed. "the world is full of kings and queens, who blind your eyes and steal your dreams, it's heaven and hell"
Last edited by tofferman; 05-16-10 at 07:09 PM. Not a big metal fan, but Dio had an awesome voice. Love the work he did with Roger Glover on the Grasshopper's Ball album. RIP RJD. Had the pleasure of seeing Heaven & Hell twice in the past few years. The most amazing voice and he always seemed like a first-class guy. I'll be listening to all my RJD-Sabbath CDs this week in tribute. ^ I see that he even stood up for the photo. I noticed that too. Most rock stars today pose to fan photos either talking on a cell phone or with a ''just get this over with, already'' look on their faces. He left such a ginormous legacy of music: Heaven & Hell, Mob Rules, Dehumanizer, The Devil You Know, Last In Line, Holy Diver, Sacred Heart, Ritchie Blackmore's Rainbow... my heart is aching at the loss of such a legend (and by all accounts, a straight up guy), but the legacy of music he created will never be diminished.